I am a huge sucker for personality tests. It started young, I think – I’ve known I was an INFJ/ENFJ since I was a kid. Over the years I’ve branched out from the Myers-Briggs and taken a wide variety of tests, usually in either a school or work setting. Most recently the Collection Management division at UNT did the True Colors personality test. 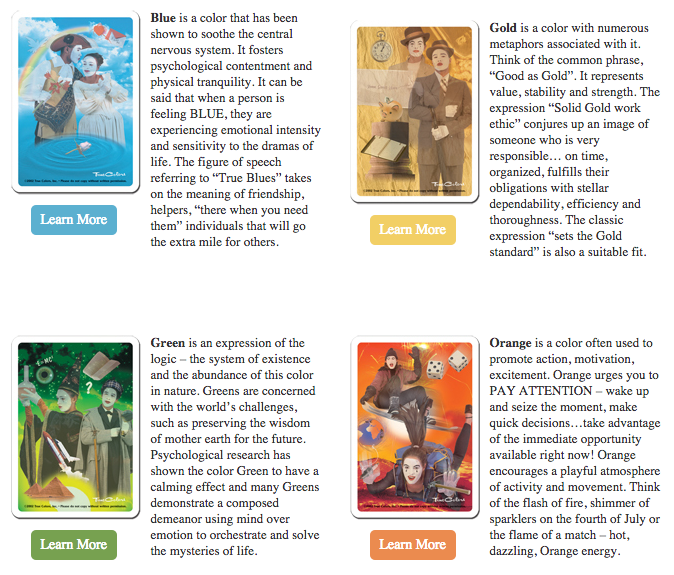 In this one you are ranked in four colors which each represent personality traits: blue, green orange, gold. I was skeptical, honestly, because the assessment seemed too simple. It consists of just five rows of attributes organized into four columns that you score as most-to-least accurate personal descriptors. And, of course, I became even more skeptical because I first scored everything backwards so my results ended up being way off. But once I got things straightened out (it was funny to see my coworkers disbelieving faces when I announced I was a gold which I am certainly NOT) the results were surprisingly accurate. The point is that this was a valuable exercise in self-awareness as well as team building. I learned about what motivates and what irritates my coworkers and what different skills sets each of us possess and value. However, I learned the most not from the test results themselves but from hearing feedback and opinions of my colleagues as we analyzed ourselves and discussed in which ways we fit the different categories (colors). It would be interesting to design a personality test that is wildly inaccurate but designed to foster conversation and collaborative skill analysis – I bet that would be just as valuable as something like this. 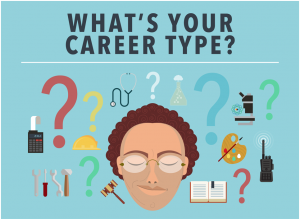 All this to say – I love categorizing people through personality tests because I think it is a fun as well as professionally valuable activity. Among other things, it can help you understand why some tasks are difficult or unpleasant while other people excel at them. That being said, I really dislike personality tests that are used to categorize people into specific careers. This is commonly done in college and high school and, while it can be interesting, these tests simplify careers to the point that the test results are pointless and even harmful because they might keep someone from following a certain career path that might be a perfect fit for them. 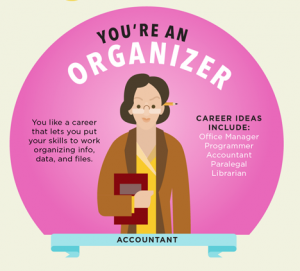 My initial response was irritation that it simplifies librarians into one role – that of an Organizer. That old-fashioned idea that librarians spend all their putting books on shelves using the Dewey Decimal system and maintaining a catalog. It wouldn’t surprise me to find out that the largest percentage of librarians are actually ‘Helpers’ not ‘Organizers’. This is probably especially true in school and public libraries but also in academic libraries – particularly librarians in Reference & Instruction or Public Services. Some academic librarians are Persuaders – they often end up as deans or other administrators and there are definitely Thinkers in the academic library. And we definitely have and need Creatives in the academic library – to support the art students and faculty or run the music library, among other things. But then I started thinking about the other careers mentioned. Couldn’t someone become a physician out of a desire to be a help people rather than practice science? Programmers, in my experience, are often more like Builders than Organizers – they are just building digital objects or applications instead of doing carpentry. So maybe this kind of categorization is useless all around, not just for librarians? Or are librarians just especially hard to categorize because we, as I’ve heard said, “wear lots of hats” – especially, perhaps in the academic environment?